JMTS CCTV services in Patna is well known as best authorized dealer and service centre for CP Plus and Hikvision cctv HD cameras ( dome / bullet ), DVR. Our experienced cctv technician / service engineers are expert in installation and repairing of any brand cctv cameras including wifi configuration / cloud storage or online mobile view configuration in DVR settings. 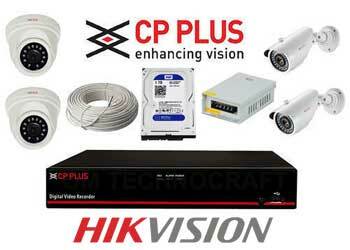 Cpplus and Hikvision are very popular brand name in cctv industry in India. We at JMTS CCTV services in anisabad, Patna never compromise on quality service. We focus on after sale service of CCTV devices like DVR, dome cameras, bullet camera etc. This is the main reason our customers are increasing daily by means of mouth publicity. We have customers in Anisabad, Phulwarisharif, Beur, Mitra mandal Colony, Police colony, Ali nagar, Jay Praksh Nagar, Kankarbagh, Bypass, Boring Road, Patliputra colony, Raja bazaar, Digha, Ashiana, Saristabad etc. areas in Patna. Due to increase in unwanted incidents like theft, snatching, criminal activities, vehicle theft, misconduct in offices, need of CCTV camera installation has increased by 60 percent in last two years. CCTV has been named as third eye which records all activities of the vision covered by the camera in high definition HD mode. Various popular brands like CP PLUS, Hikvision advertise about the need and benefits of CCTV camera installation in houses, offices, outdoor or in public places. If you are running a school / college / institute or an owner of private office or child and old parents are there in house, then cctv cameras play a vital role in monitoring and better handling of situations. Now you can see cctv cameras installed everywhere in your neighborhood or outdoors. CCTV prices at JMTS constech Pvt. Ltd. are very competitive. We use only branded devices like camera, dvr ( 4 channel / 8 channel ), hard disk drive, cables of various brands like cpplus, hikvision, Seagate, Toshiba etc. which are having authorized service centre, repairing centre in Patna, Bihar. Whatever is your budget, we have the solution. Our cctv camera technicians are capable in installation of approx 100 cameras in a single day. If you are a owner / manager / secretary of an apartment or society and security is your prime concern then contact us for cctv installation in budget for complete peace of mind. Today guidelines from government or security agencies or police stations are always in release for cctv cameras installation for security issues.